We’d love your help. Let us know what’s wrong with this preview of For Those In Peril On The Sea by Colin M. Drysdale. Primarily set in the northern Bahamas, this book weaves its story of post-apocalyptic survival into the local sub-tropical seascape and the sailing culture that can be found there. With its evocative use of real locations haunted by zombie-like infected and atmospheric depictions of the trials of life at sea drawn from the author’s own experiences, For Those In Peril On Th Primarily set in the northern Bahamas, this book weaves its story of post-apocalyptic survival into the local sub-tropical seascape and the sailing culture that can be found there. 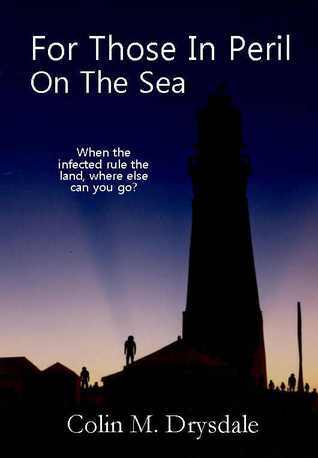 With its evocative use of real locations haunted by zombie-like infected and atmospheric depictions of the trials of life at sea drawn from the author’s own experiences, For Those In Peril On The Sea provides a new and unusual take on the traditional post-apocalyptic genre. There was nothing to suggest it would be anything more than a routine delivery. Four people thrown together by chance, sailing a newly-built catamaran from South Africa to Miami. But while they were away, something happened, something none of them could ever have imagined. When they get back to civilisation, they find it no longer exists. The land is no longer safe. Their only option is to stay on the boat and try to survive. To ask other readers questions about For Those In Peril On The Sea, please sign up. Primarily set in the northern Bahamas, this book weaves its story of post-apocalyptic survival into the local sub-tropical seascape and the sailing culture that can be found there. With its evocative use of real locations haunted by zombie-like infected and atmospheric depictions of the trials of life at sea drawn from the author's own experiences, For Those In Peril On The Sea provides a new and unusual take on the traditional post-apocalyptic genre. Compelling. Original. A better-than-average zombie story. For Those In Peril On The Sea is a zombie apocalypse tale with a cool premise -- a group of survivors of the apocalypse creating a floating community on the water near a small island in the Abacos, fending off the infected, dealing with the rapidly-changing weather, scavenging abandoned boats in the docks and some of the smaller less-dangerous islands nearby for supplies, trying to maintain peace within the community as personalities clash Compelling. Original. A better-than-average zombie story. For Those In Peril On The Sea is a zombie apocalypse tale with a cool premise -- a group of survivors of the apocalypse creating a floating community on the water near a small island in the Abacos, fending off the infected, dealing with the rapidly-changing weather, scavenging abandoned boats in the docks and some of the smaller less-dangerous islands nearby for supplies, trying to maintain peace within the community as personalities clash and disagreements occur, coming up with ingenious inventions like garden boats to grow crops on to help them survive. The story has an engaging introduction, giving the reader a creepy glimpse of the chaos that is the beginning of the outbreak through a succession of radio news reports. The zombies themselves -- people infected with an advanced form of rabies that fills them with anger and hate, and makes them want to kill anyone who is not infected -- are scarily dangerous. They are fast, strong, and it is very easy for someone to become infected in an encounter with them. This adds a lot of tension and suspense to the plot, pushing the survivors off the land and into boats for fear of the infected population, forcing the characters to be super careful whenever there is a chance that they will run into the zombies. The detailed exploration of boats as a salvation in the zombie apocalypse is a fresh story element, and it works really well in this book. Consider this: You’ve been hired to deliver a boat from South Africa to Miami. You begin your journey across the Atlantic with a small crew of four. All goes well until a horrific storm blows in and strips you of your communication systems. You are completely cut-off from the world for weeks. It is a long tedious passage and you are anxious to enter the harbor of Miami, only when you arrive there is nothing left. Miami is burning to the ground and the people that you see on shore no longer resemb Consider this: You’ve been hired to deliver a boat from South Africa to Miami. You begin your journey across the Atlantic with a small crew of four. All goes well until a horrific storm blows in and strips you of your communication systems. You are completely cut-off from the world for weeks. It is a long tedious passage and you are anxious to enter the harbor of Miami, only when you arrive there is nothing left. Miami is burning to the ground and the people that you see on shore no longer resemble anything human, but rather gross imitations that growl and snarl at you. The decision is made to continue on to another harbor only to find the same. The world as you knew it six weeks ago has been forced to its knees by a disease that has ravaged mankind turning them into mindless, flesh devouring beasts. This is the situation that Colin M. Drysdale has place his characters, Bill, Rob, Jon, and CJ in, and it seems that they will be exiled to the sea forever—otherwise they will fall victim to the man-eating monsters that prowl the shores. How will they survive? Is there anyone else out there? For Those in Peril on the Sea by Colin M. Drysdale was a gripping tale of loss, triumph, heartache, victories, but mostly the will to survive in a new world with so many challenges. The book was intriguing, and sometimes terrifying enough that I had put it down so that I could absorb what I had read. Mr. Drysdale’s writing is smooth and wonderfully descriptive. He has an impressive knowledge of boats, sailing, and of faraway lands. For Those in Peril at Sea is a terrific read, but be forewarned it is not necessarily for the vanilla reader. Mr. Drysdale’s accounts can be very graphic—which is a testament to his amazing writing skills, but some may find the scenes upsetting. I look forward to reading and reviewing more books by Colin M. Drysdale. 5 STARS! For Those in Peril On the Sea was really enjoyable. I initially assumed the sea would be used for little in the book except as a means for the characters to get from location to location. I found the fact the characters formed a floating community on the water a welcome and unexpected twist. Another one of the aspects I enjoyed about this novel is the fact that it seems no one is safe. Like many of the most popular literary works of our time just as you become attached to a character in this zomb For Those in Peril On the Sea was really enjoyable. I initially assumed the sea would be used for little in the book except as a means for the characters to get from location to location. I found the fact the characters formed a floating community on the water a welcome and unexpected twist. Another one of the aspects I enjoyed about this novel is the fact that it seems no one is safe. Like many of the most popular literary works of our time just as you become attached to a character in this zombie novel, they can be taken from you. Like any good book, I found myself in agony over some of the decisions made by characters. Two of my favorite moments are when lead characters are trapped in a beached shipping container surrounded by zombies and when they become surrounded by a huge zombie horde in a lighthouse. The unfortunate decisions of the characters along with the vivid descriptive writing in these scenarios really put you in the moment and keeps you invested in the story as a reader. Is that the kind of noises zombies make? ..Hopefully I never get to find out. Anyways! This book scared the crap out of me - in a good way. Well..okay honestly if Mr. Drysdale didn't make the characters grow then that'd be pretty ridiculous. Every choice you make is probably life or death. At first I was like wow, they have it way too easy. Just chillin' in a boat. No big, we can fish for food. There are beds. It's fine. Nah. They start to run out of food and then they lose their leader??? Dangg. Oh, but look there is a community of people also living on the boat. Too bad there's a crazy psycotic guy who thinks that the best way to live in a world like this is to fight the zombies. How does he think he can achieve this? By killing off some great people sigh. Fast paced chilling novel. Made me stop and think. Maggie. What would you do if zombies took over the world? Probably go to Costco. Though not actually come back to life brain eaters these are just as good. They are caused by a drug company doing illegal testing that went way wrong. The author has a fantastic imagination. Makes me wonder what else is lurking up there that might become his next book. I'm so glad he worked as an extra on the movie World War Z where talking with others gave him the incentive to turn his ideas into this great story. Part of me is hoping for a sequel but I like the way the book ended so I LOVE ZOMBIES! Part of me is hoping for a sequel but I like the way the book ended so if there isn't one I'm fine with that too. If you like zombie-type apocalyptic books this is one you should definitely try. Kept me interested and wanting to read more of the series. A bit disappointed to find after I read it that the next book in the series doesn't start out with the same characters. The same characters as the first book don't come back until book 3. Would probably give it 3.5 stars but haven't figured out how to give half stars. I borrowed this from the Amazon Lending Library, as I was interested in reading a zombie novel. I thought it was an interesting twist on the "normal" zombie stories. I thought characterization could have been a bit better, but I stayed engaged throughout the book. Excellent!! An interesting, thought provoking new take on the zombie apocalypse genre. Lots of nail biting, tense moments. Great action. I loved it. If I could gave given it 10 stars I would have! Highly recommend this one. Well, this is the first post apocalyptic zombie book I've read, so nothing to compare it to. But, I'll have to say, the book hits the spot. The story plays along nicely and the language is fluid and easy reading. The story is full of ups and downs, keeping the reader glued to the book till the end. Really great zombie book! Already bought Drysdale's other two books. Winner of the Best Indie Book Award! I liked it. Very easy read. Zombie infestation on the land. Small group of sailing vessels and yachts struggling to survive. Picked it up for 99 cents on amazon. Colin M. Drysdale was born in Glasgow, Scotland. He studied Zoology as an undergraduate at Glasgow University and has a doctorate in whale biology from the University of Aberdeen (also in Scotland). As part of his work, he has travelled extensively, and has spent time sailing around the west coast of Scotland, Newfoundland, Labrador, the Bahamas and Florida. He has also spent time in St. Helena, V Colin M. Drysdale was born in Glasgow, Scotland. He studied Zoology as an undergraduate at Glasgow University and has a doctorate in whale biology from the University of Aberdeen (also in Scotland). As part of his work, he has travelled extensively, and has spent time sailing around the west coast of Scotland, Newfoundland, Labrador, the Bahamas and Florida. He has also spent time in St. Helena, Vancouver island and has travelled overland across Canada and from Hong Kong to Glasgow by train. While he was written countless academic papers and six technical books under is real name, he chose to publish his debut novel, For Those In Peril On The Sea under a pen name to help keep some separation between his non-fiction and his fiction writing. Much of the landscapes and locations referred to in For Those In Peril On The Sea are real places that the author has visited or spent time in, especially when working in the northern Bahamas, gathering data for his doctoral thesis. July 2014 will see the publication of his second novel, The Outbreak, which is set in the same world as For Those In Peril On The Sea, but which follows a new cast of characters as they try to escape from a city as it is over-run by the newly mutated Haitian Rabies Virus. As with the first book in this series, there is a strong element of the sea and sailing culture, although this time of the author's native Scotland rather than the sub-tropical setting of For Those In Peril On The Sea. A third book will be added the For Those In Peril series in summer 2015, which will see the characters in the first two books united as their story lines finally collide. As well as well as writing novel, Colin M. Drysdale has also published an anthology of short zombie and post-apocalyptic stories, which is currently available in paperback and as a Kindle ebook called Zombies Can't Swim And Other Tales Of The Undead. This contains 23 short stories, ranging in length from flash fiction to full length short stories which have previously available through his blog.